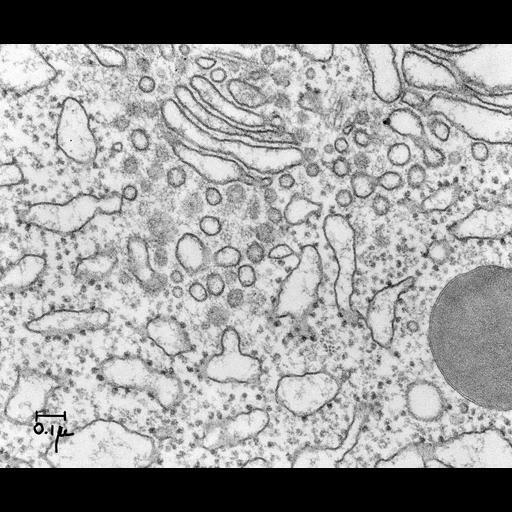 Early transmission electron micrograph of a thin section of a secretory cell from guinea pig pancreas illustrating vesicle trafficking between the rough endoplasmic reticulum and Golgi apparatus (upper center). Portion of a mature secretory granule is seen at right. Image made available by James D. Jamieson and the Department of Cell Biology, Yale University School of Medicine. Original 3.25 in. x 4 in. lantern slides were scanned at 600dpi. Original Magnification: x43,000.